This world-renowned art museum is home to an impressive collection of art. You can see international works that include ancient Egypt and modern Europe. You can see mummies, sculptures, paintings, suits of armor, jewelry and much more. There are spears, swords, daggers and muskets that go back centuries. Located north of the Inner Harbor, general admission to the museum is free. 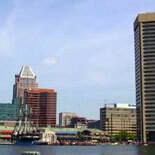 Situated at the Inner Harbor, this outdoor entertainment venue provides free shows for you to enjoy. You can watch rock bands, pop bands, street entertainers and more. You can take a break from your shopping or sight seeing, relax and enjoy the show. Known as the first cathedral in the country, this gorgeous church was built in the early 1800s. You can take a stroll through history and view impressive art and architecture while visiting the cathedral. On the grounds, there is a stunning Pope John Paul II Prayer Garden, which was inspired by the Pope’s visits to the Basilica. Located in the Mount Vernon neighborhood, this memorial is the first monument erected to honor the nation’s first President. You can climb more than 200 steps to see a spectacular view of the city. Even though it is free, they will ask for a $1 donation. Poe lived in Baltimore for much of his life, and he was buried in the city. Poe, his wife and mother-in-law are all buried in Westminster Burying Ground in Baltimore. You can see the final resting place of this great author. This memorial is a moving reminder of the tragedy of the holocaust. There is a bronze sculpture that illustrates a group of holocaust prisoners huddled together and being incinerated by fire. This tower is one of the largest buildings in Baltimore and is a studio for artists. You can see fascinating works of art and studio tours are available during certain times of the year.